Preheat oven to 475 degrees F. Beat eggs with electric mixer until well mixed. Add milk, cream, sugar, salt and vanilla and mix until sugar is dissolved. Add sifted flour and mix until smooth. Let batter rest 10 minutes. Melt butter in oven proof skillet, swirl pan to coat bottom evenly with butter. Pour batter into pan. Bake in oven for 14-16 minutes or until golden brown with dark brown around the edges. Remove the pancake from the oven and rest for about a minute. Loosen pancake from edges of pan with a spatula. Slide pancake onto a plate. Dust with powdered sugar and serve with lemon wedges, butter and syrup. NOTES: It was in 1953 when Les Highet and Erma Huenke opened their first Original Pancake House in Portland, Oregon using traditional pancake recipes handed down through the generations. Now, with over 100 restaurants in 25 states, this breakfast chain is generating a huge cult following. That’s probably because many of the authentic ethnic pancake recipes can’t be found at IHOP, and is a clone recipe for one of them. 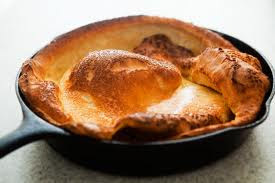 The German Pancake is baked at a high temperature in a skillet where it puffs up radically in the oven, then settles down as it comes out. It’s dusted with powdered sugar, and serve with whipped butter and lemon wedges on the side. Delicious. You can also apply maple syrup, if that’s your thing. A cast-iron skillet seems to work best for this recipe (just as they used back in the day), but you can get away with non-stick, if that’s all you’ve got. If that’s the case, you should know that the pancake will morph more radically in a non-stick pan and practically overflow the skillet -- especially if it isn’t a deep one. Even so, once you get it out of the oven it will shrink back down and taste just as amazing.